I believe that a person can live comfortably in 600 square feet. Graciously, even, provided those square feet are well-designed. One thing has bugged me since I moved into my comfortable little 600-square foot house, years ago: about ten percent of the space in here is absolutely wasted. That ten percent could be the dining area I've never had, and recapturing it would make the difference between comfortable and gracious. That's what my "kitchen remodel in a weekend" is all about. 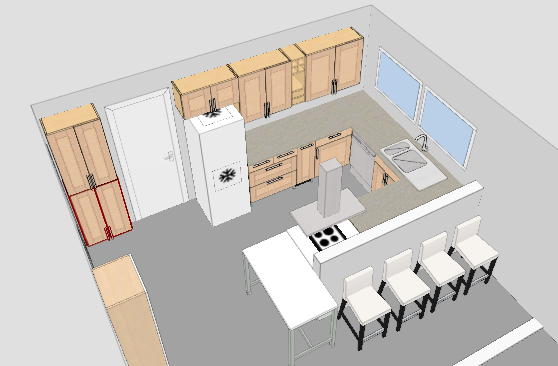 The kitchen needs to shrink so the living room can expand to hold a dinner table and four chairs. But here's the problem: for the kitchen to be smaller, dammit, I need appliances and fixtures on a European scale, not "family-sized" American ones. Why does it cost a freakin' fortune to live in a smaller space? Why does a 24" refrigerator cast twice as much as a 36" one? The problem (including weird hollow unusable wall space), and the solution. The big plan. That heavy white line in the foreground is the wall that's coming out. The part that's done: new wall cabinets. Note humungous fridge that cost about half what a small-footprint one costs. Next phase: base cabinets and new sink. And a dishwasher--my first ever! Hah! I know just what you mean. Decluttering last year got me through a lot of that hoarding mentality, but I find that stuff is re-accreting while my back is turned. You'd think with all the urban densifying, in-fill, row-house-building and condo-converting going on, smaller (but quality) appliances would be more the norm. It's getting a leeetle better, slowly. The cabinets are IKEA's standard kitchen system with Adel birch doors. And the plan and dimensional drawings are out of their free kitchen planning software. I LOVE that stuff! Always was nuts for a floor plan. I like that table... stainless steel? Looks easy to keep clean. Yeah. IKEA, Utby is the model name. It does double-duty as a work surface and a cafe-height eating table. Triple duty if you count that it also blocks wi-fi like magic. Seriously, unless I put my laptop on a rubber mat on it, it drops the wifi connection, even though the router is only 13 feet away. In case of nuclear war, I'm totally running to IKEA. You crack me up. I was going to say earlier that your post about shopping for clothes made me laugh and cry. sounds like you're having a lot of fun (besides all the actual grunt work). I am. I admit it. I LOVE amking floor plans. And are you ever good at it! Well, the software does most of the work. I'm good at nudging the little pieces around till they FIT, dammit! In other words, I'm kind of obsessive. Oh, the cabinets look great! I got my employer to send me to AutoCAD training some years ago, even though I'm not an engineer or a drafter. I was a facilities manager, and I convinced them that I needed to be able to make floorplans. I was in HEAVEN. It is really coming together nicely. Love the color choice for the back wall too. Very updated and yet neutral. It's really looking great, even with the old large refrigerator! Maybe when I get my glass kiln I can make you some glass tiles to go on the back-splash! Oh man, that would be SOOOO cool! I can just see them, interspersed in a background of little 1-inch glass squares (I'm planning on using the same tiles as in my shower--might as will stick with a winner). I don't seem to get tired of the general color scheme of olive-y green, nickel-stainless, honey, cream, and espresso-black. So...when is the glass kiln coming into your life? You didn't mention your class last time we met--did it finish? Was it good? Looking good, looking good!! God bless IKEA, and how it's shown the "bigger is better" American mentality that small is beautiful. There's a great show on HGTV called something like "Small Spaces, Big Design" and they regularly feature homes that are 800, 700, 600, even 400 sq.ft. and how people have made them into the perfect living space. Every available space is used efficiently AND beautifully, and it just seems so light (as in "not burdensome"). It's not just a space, and more than a lifestyle, even, it's a mindset, a way of thinking and being, and I find it extraordinarily attractive. Which is all a long way to say kudos to you and your new adventure toward making the best use of your space. Gracious living, indeed! I've always found much more creativity in making a small space work than in trying to get more space. I have a great fascination for multi-function, hidden, recessed, pull-out-as-needed, ultra-compact household things. I think I lived in Europe at just the right moment in my life--it imprinted me. In order to live in Paris, people would rent what amounted to a closet, and somehow make it work. Imagine! Only a single gas ring. No weird refrigeration fetish, because fresh food is always available. Any old platform with a mattress makes an acceptable sleeping-spot. But two plates, two cups, two chairs and a table were a bare minimum--as, I notice, they are in even the tiniest vignettes at IKEA. I LOVE that shared food is at the center of small-scale living. And that's the piece that's been missing from mine all these years, that I'm going to fit into the puzzle here pretty soon. And I was going to mention: last time I was in France, I rented a house for a week. 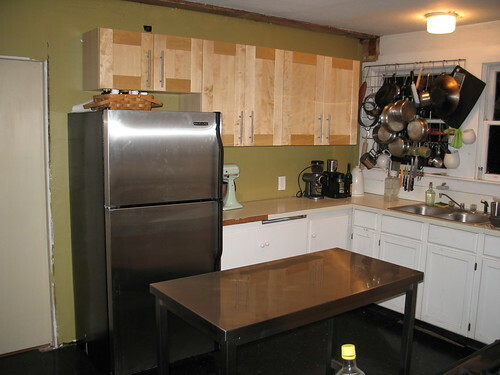 The kitchen had a combination-fuel cooktop, a small convectional wall oven, and a small fridge in a cabinet. (All, it turns out, IKEA--but not available here). I complimented the owners on their lovely compact arrangement and said I wished I could get such a nice small fridge at home. "It's one of the biggest ones they make!" replied the owners. I'm giving serious consideration to this fridge from Spain.